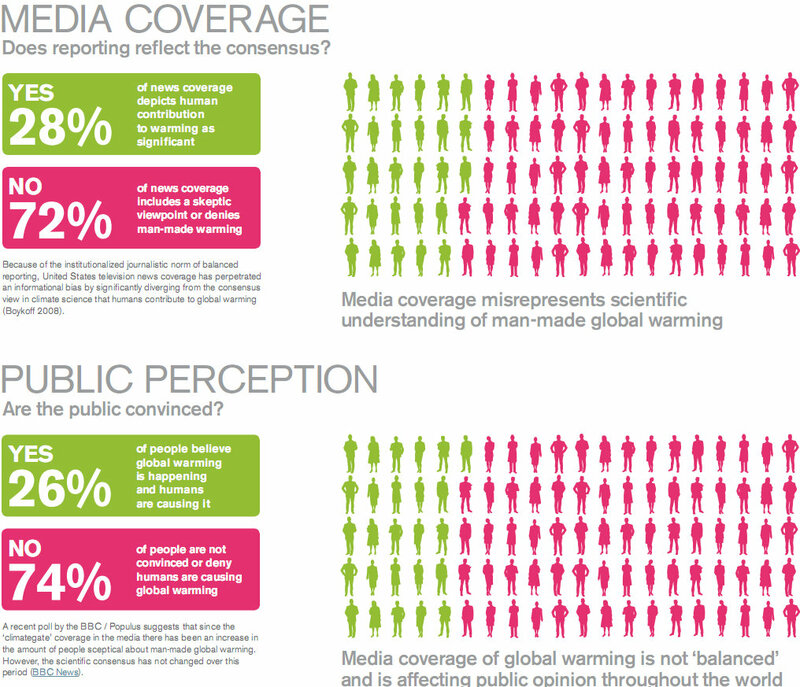 The graphic below comes via our friends at [un]skepticalscience, assuring us that while 97% of "climate scientists think that global warming is 'significantly' due to human activity," a shocking 72% of news coverage does not reflect this "consensus" and similarly 74% of the public are not convinced. 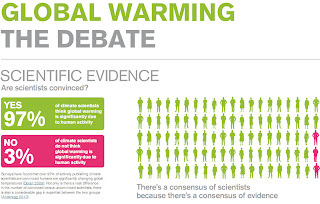 However, close examination of the source of the claimed 97% consensus reveals that it comes from a non-peer reviewed article describing an online poll in which a total of only 79 climate scientists chose to participate. Of the 79 self-selected climate scientists, 75 agreed with the notion of AGW. Thus, we find climate scientists once again using dubious statistical techniques to deceive the public that there is a 97% scientific consensus on man-made global warming; fortunately they clearly aren't buying it. They cant even get the arithmetic right. 76 out of 79 is 96.2%, which is 96% to 2 significant digits. pete66, they just can't resist adjusting upwards :-) It's congenital. It's hard to return to obscurity once you have been a star. These "scientists" will fight to the bitter end. Infamy is better than no attention at all. We should put together a Joke Book based on the comments on Skeptical Junk Science. I guess I don't care much for statistics, percentages, and the "numbers" about climate change or AGW. The data is incomplete, faultily obtained, and shoddy work has made the presentations. It is really quite unscientific to present results as though they were obtained in a lab under very controlled conditions. It can never be that way. So scientists will always be off the mark when they study the climate. In reality, tree rings, ice cores, and other ancient indicators can only tell us perhaps what was. It cannot tell us anything at all about the future. So, such data just is not helpful about the future of the planet. What the sun is going to do and how much will volcanic activity affect the atmosphere is the only area that has promise. It has been neglected so far. I hope that changes. Now you know. 1. When compared with pre-1800s levels do you think that mean global temperatures have generally risen, fallen, or remained relatively constant? Of course, the answer to #1 is "risen", if you consider "pre-1800" to be around 1800 or a couple of hundred years of so before, because we were int he little age age, and there's little doubt we have warmed form that time. The answer to number #2 depends largely on the definition of significant, but I'd guess that even Richard Lindzen would consider the co2 contribution significant, based on his forcing calculation. And of course, warmers seem to treat a risen/yes reply to this poll as affirmation of catastrophic AGW projections, which may not be intended. Climatescientology . . . making alchemy look like really, really good science. According to the article, the 97% is 75 out of 77 responders to the survey. "Through quantitative content analysis, results show that 70% of U.S. television news segments have provided ‘balanced’ coverage regarding anthropogenic contributions...."
"Out of 212 global warming-centered program segments, including some online background info pages, only three on-air segments had discussion of basic skeptic science". 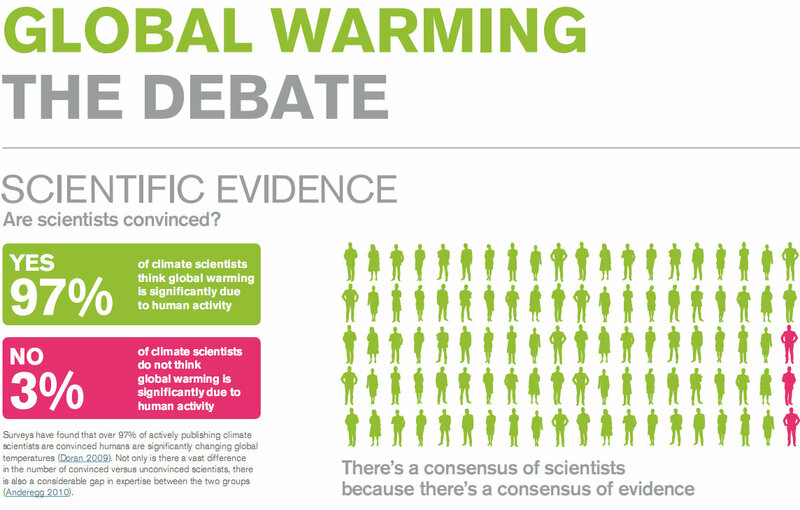 If that's only one of the major news outlets, how much 'pro-skeptic' non-balance would be needed to achieve the figures that the skepticscience graphic asserts? It is a rather big lie to pretend that the news has been balanced between skeptic and believer. Believers get vast amounts of free press, huge sums of money from industry and tax payers and private foundation. Believers get to intimidate publications, agitate for the criminalization of skeptics, and get to call skeptics deniers, as if skeptics are somehow holocaust deniers. Yet they are failing in the public square. How can that be? Kudos to MS for running this and Climate Depot also giving it legs. I first wrote about the fake 'consensus' last March but no one else picked it up then-strange how it goes sometimes. Hopefully now this con trick is firmly under the spotlight more fence sitters will wake up to the climate sham. Pete66: they got the math right. it was 75 out of 77. Of these specialists, 96.2% (76 of 79) answered “risen” to question 1.
thanks all for pointing out it was 75 not 76 who agreed with the 2nd question regarding AGW. I have edited the post to reflect this. The liars are still winning. Sorry I meant politicians!!! Freudian slip there. In the U.K. we have a total greenie in charge of the environment and energy. This will mean higher bills. How ironic that the left wing greenies may succeed in wealth redistribution but not in the way they planned.The rich get richer , the poor get poorer. Let us not be naive. I was taught by my statistics teacher that 97% of statistics quoted in debate are invented. "...we use an extensive dataset of 1,372 climate researchers and their publication and citation data to show that (i) 97–98% of the climate researchers most actively publishing in the field support the tenets of ACC outlined by the Intergovernmental Panel on Climate Change, and (ii) the relative climate expertise and scientific prominence of the researchers unconvinced of ACC are substantially below that of the convinced researchers." So it seems that the 97% is some sort of average of the results from Doran & Kendall-Zimmerman (2009) and Anderegg et al (2010), both peer-reviewed publications. Would that make much difference if it was 96% or 98%? Really now, you've got to be kidding me. Your link doesn't even mention this article. You're going to have to show actual proof that it is peer-reviewed, and if it is my opinion of the peer-review process in climate "science" will sink to a new all-time low. I didn't even mention many other flaws in this article, including not defining the word "significant" in the polling question. For many other flaws read the 100+ comments over at WUWT. Now, as to the second piece of trash you mention, written by a grad student and Steven Schneider, that is so hopelessly flawed that even several warmists condemned it. It's all over the blogosphere if you care to read the details. BTW that paper was NOT peer-reviewed. PNAS is a vanity press for members of the NAS and publishes articles from NAS members WITHOUT peer review. PNAS is becoming a laughing stock with this paper and the recent Oppenheimer paper telling us "climate change" is going to flood the US with illegal aliens. And tell me what other area of science finds it necessary to take pathetic polls on a "consensus." The link I provided to EOS shows that EOS is a peer-reviewed publication. If EOS is a peer-reviewed publication, it is only logical to infer that any article published on it was peer-reviewed. If you find that this is not the case, please let me know. As for PNAS, I'm afraid you are misinformed. PNAS is a highly prestigious journal, and it is peer-reviewed. As for the flaws of both papers, I read some of the criticisms online, and I found the majority severely lacking. Feel free to point me to any you found particularly cogent, and I will take a look at it. and has some "refereed articles" and some non-refereed articles, and doesn't have abstracts on non-refereed articles like this one. Even if this article was "refereed," it is nonetheless pathetic. PNAS used to be a respected journal, but these 2 non-peer-reviewed articles have sullied it's former reputation. I'm damned low-class. Back in college, the fact that I once expressed a liking for Kipling's poetry in an honors English Lit class got me a ripe snarking from the instructor. "Showed me the way to promotion an' pay"
There's the whole of what drives the "climatologists" invited to participate in this survey. They get their grant funding from sources interested in supporting the great anthropogenic global warming fraud. These guys are going to express a "belief" contrary to the warmist orthodoxy? Sooner expect a Baptist minister who gets better than 50% of his living from serving the spiritual needs of a Baptist congregation to express an opinion against divine beneficence or the reality of hell. If 75 out of 77 people that depend on global warming for their livelihood believe in AGW are the other two frauds? 'In trying to overcome criticism of earlier attempts to gauge the view of earth scientists on global warming and the human impact factor, Doran and Kendall Zimmerman sought the opinion of the most complete list of earth scientists they could find, contacting more than 10,200 experts around the world listed in the 2007 edition of the American Geological Institute's Directory of Geoscience Departments. In analyzing responses by sub-groups, Doran found that climatologists who are active in research showed the strongest consensus on the causes of global warming, with 97 percent agreeing humans play a role. Petroleum geologists and meteorologists were among the biggest doubters, with only 47 and 64 percent respectively believing in human involvement. Doran compared their responses to a recent poll showing only 58 percent of the public thinks human activity contributes to global warming. "The petroleum geologist response is not too surprising, but the meteorologists' is very interesting," he said. "Most members of the public think meteorologists know climate, but most of them actually study very short-term phenomenon." 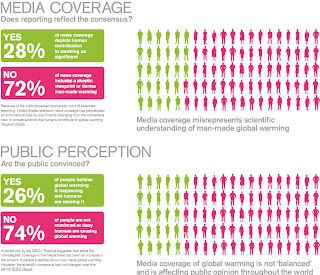 Note that the survey comprised NINE questions, about global warming, to earth scientists. Only two of the questions have ever been revealed, and the results assessed from those two alone. These two do not consider the magnitude of human influence at all. There is no mention even of CO2. Now what on earth were the other 7 questions about, to earth scientists?- Cooking? Sport? Why is the EOS article so coy? Al Gore and his "ship of fools" have told this AGW lie for so long, that these "political hacks" are actually beginning to believe the lie themselves. Science be damned. The lack of warming be damned. Take away the funding and the concensus will disappear. Secondly you should sight the sources for all the other statistics you claim. Uh, the correct word is "cite," not "sight"
That pathetic PNAS paper is just as flawed, if not more. Read the comments above & all over the web; even warmists have denounced it. What "other statistics" do you want "sighted"? I once read that on an average we have an ice age approx. every 22,000 years. Sometimes it happens up to every 40,000 years and even documented that one was around 100,000 years. It would seem to me that in between these ice ages we would have to have some global warming of some type to melt the ice. Don't quote me on the exact timing here because it was some time ago this old fart memory read this but I believe that it was 11,500 years ago that the last ice age occurred. Here I see us as in the middle between ice ages. I'm no scientist but common sense would tell me that we would probably be the warmest time period between ages. Major ice ages are about 100,000 years apart, and it has been over 100,000 years since the beginning of the last ice age, so some believe we are "overdue"
The similar figures of public perception and media coverage only goes to show that media coverage guides popular opinion, regardless of the actual evidence. I think that CAGW is fiction and fraudulent; the IPCC should be disbanded, the useless windmills knocked down and those ripping off the taxpayer by pushing the CO2 alarm with pseudo-science like the hockey sticks jailed. And yet, according to the Doran & Zimmermann survey, I am in the 97% ! In 2012, a total of 22 state and extension climatologists were selected through a purposive sample to represent main outlets of publicly available and location-specific climate information in the region. Nineteen of these climatologists completed a pre-interview survey that included the climate change question (see Wilke 2013). Consistent with the many disciplinary scientists in the two USDA-NIFA projects, over 90% of the climatologists agreed that climate change is occurring while none believed that it is not occurring (Table 1). Fifty-three percent attributed climate change primarily to human activities. An online survey of about 1600 private and public agricultural advisors was conducted in 2012 in four states (Indiana, Iowa, Michigan and Nebraska) in the Midwestern United States. Three-quarters of these advisors believed that climate change is occurring with 12% of them believing that it is mostly caused by human activities (Table 1). Extension educators are a unique set of agricultural advisors who serve to connect and translate research from universities to farmers in order to decrease risk to the farm enterprise and increase productive capacity and resilience. Typically, Extension educators have at least a Masters degree and are trained in agronomic sciences, which may not include climate sciences. Almost 75% of the Extension educators believed in climate change, with over 19% attributing climate change to human activities (Table 1).